Our robust and comprehensive Quality Systems enable us to successfully operate in supplying our products to the most demanding sectors in the UK and Worldwide. These include Oil+Gas, Power Networks, CNI, Border Security, Custodial and High Security, Rail and many others. 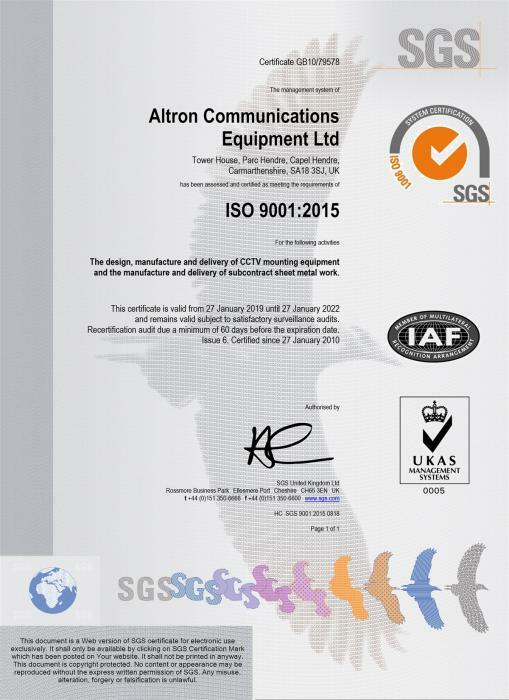 ISO 9001:2015 gives greater emphasis in senior management involvement in the QMS rather than one designated individual and also in the organisation having structured plans in place for addressing risk, shortfalls in knowledge, feedback for improvement and continuous improvement – all areas that we see as key in our commitment to providing a high level of customer service and being the competitive choice for CCTV mounting products in years to come.